Rather than escape the blistering heat of summer, there may be good reason to embrace it. For the first time, research has shown that heat acclimation can lead to performance gains similar to that achieved through hypoxic (low-oxygen) training. 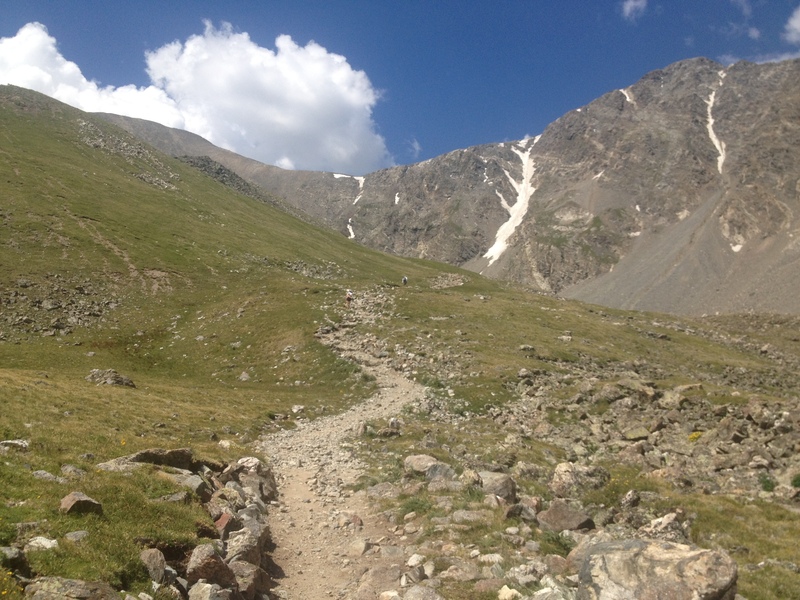 The benefits of training at altitude have long been heralded by endurance athletes. Essentially a natural form of doping, the rise in erythropoietin (EPO) is swift in most individuals – helping to boost red blood cells and oxygen-carrying capacity of the blood within 24-48hrs of arriving at altitude. In the real world, most athletes aren’t fortunate enough to live at or near altitude and don’t want to drop the money to snooze in an altitude tent. Luckily, sweltering summer heat is readily accessible. UK researchers asked male cyclists to complete a self-paced hypoxic time trial before and after a series of 10 daily 60-minute training sessions in either hot (40oC), hypoxic, or control conditions. In the hypoxic condition, the percent oxygen approximated a target altitude of about 10,000ft. Findings, published in Frontiers in Physiology, showed that hypoxic time trial performance and power output were comparably improved for the cyclists who trained in both the low-oxygen and hot environments. Those who trained in the control conditions saw no gains. Similarly, blood results indicated that the 10-day training protocol in both the hot and hypoxic conditions improved cellular tolerance to exercise. Heat shock protein (Hsp) 72 was of particular interest, as it has been linked to delayed tissue injury and cellular resilience to environmental stressors (such as… hypoxia). Moreover, the authors note, “Heat acclimation induced a greater adaptive stimulus at lower levels of metabolic strain, and in a shorter time frame compared to hypoxic acclimation.” These conclusions were based on the finding that the heat-trained group showed a more efficient aerobic profile, with increased hemoglobin saturation, a higher oxygen pulse (more O2 uptake per heartbeat at rest), and a significantly lower exercise heart rate following acclimation. There was also a smaller increase in body temperature during exercise for the heat-trained cyclists. The implications here are potentially huge for athletes, suggesting that heat-based training could offer a more proficient means of improving altitude tolerance than equivalent training at actual altitude. An important caveat here is that hypoxic conditions were normobaric. Because pressure wasn’t altered, it’s not yet known whether these findings would hold at natural (i.e., hypobaric) high-altitude environments. In addition, these researchers went quite hot with their heat-trained group, subjecting them to 40oC (104oF) conditions. Hopefully, the minimum temperatures necessary to reap these physiological benefits are not quite so stifling! So, if you’re preparing for a high-altitude trek, ultramarathon, adventure race, or any other aerobic event up high, you might want to simply tap into the cardiovascular and cellular benefits provided by the ever-accessible summer heat. You may be a hot sweaty mess, but you’ll be an endurance phenom! We’ve come a long way from the days when obstetricians advised women to take it easy during pregnancy. Today, healthy expecting mothers are encouraged to stay active for reasons ranging from decreased back pain and sleep problems to easier post-partum recovery and reduced risk of child obesity. Now there is preliminary research to suggest that exercising during pregnancy might even give your child’s brain a jump-start on development. As reported at last week’s Society for Neuroscience (SfN) annual conference, researchers from the University of Montreal randomly assigned women at the start of their second trimester to either an exercise or a sedentary group. Women in the exercise group were told to perform at least 20 minutes of aerobic exercise three times a week at a moderate intensity. Although, the study abstract notes that women in this group went well beyond the 60-minute per week minimum and exercised an average of 117 minutes each week. A mere 8 to 12 days after delivery, researchers invited all mothers and their newborns back to the lab. Babies were fitted with specialized caps made up of soft electrodes that detect electrical activity in the brain (a tool called electroencephalography (EEG)). Scientists waited for the newborns to fall asleep on their mother’s lap and then monitored how their unconscious brains responded to both familiar and novel sounds – a proxy for auditory memory. “This is important to look at at this stage in their development, because the ability to discriminate sounds is the basis of learning to speak and to understand the sounds around you,” notes Elise Labonte-LeMoyne from the research team. Before the media gets ahold of this news and conveys the message to expecting mothers that they can exercise their unborn children straight to the Ivy Leagues (woops, too late! ), there are some important limitations to emphasize about this initial research. Although the findings were presented at the reputable Society for Neuroscience’s (SfN’s) annual meeting, the methods and findings have not yet undergone the rigors of a peer-review, and have not yet been published in a journal. Hence, it’s difficult to really assess the quality of this work, as well as its generalizability. Among other things, we know little about how scientists monitored or determined exercise intensity in the exercise group. It’s also not clear how sedentary the “sedentary” group really was. Did the women exercise up until delivery? We’re not sure of that either. Also, the only report that I saw on the sample size indicates that only 18 women participated. It’s a start, but hardly conclusive. Finally, long-term conclusions about the capability of a person’s brain can hardly be drawn based on the results from a single test of auditory memory that is given less than two weeks after entering the world. To see if the benefits of prenatal exercise do have any lasting effects, Dr. Ellemberg and his colleagues plan to track the infants’ cognitive, motor, and language development until they are at least 1 year old. I look forward to seeing those published results! While these exercise findings are both novel and encouraging, they should – as with any science – be interpreted with caution. [Here’s a nice video from the University of Montreal’s kinesiology lab group for anyone who speaks French 🙂 or might be interested in some visual footage of the study’s methods]. At any given point in time, most people are feeling stressed out about something. 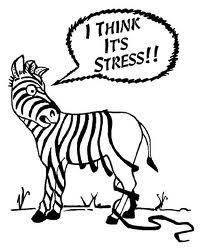 Unfortunate though it is – having stress in your daily life is often unavoidable. But being stressed is something within your control. One way to exercise that control is to — exercise. A single bout of exercise may offer protection against the emotional events and stress that we encounter later in the day. That’s the conclusion of new research from the University of Maryland (yes, I’m biased, but this is good work). The immediate ability of physical activity to boost mood and ease anxiety is well established. However, this study found that the stress-busting effects of exercise endure after we’ve left the gym, and more importantly, in the face of subsequent psychological stress. In other words, getting up and moving may make us more resilient to the effects of stress. If we know there’s no escaping a stressful event, we can at least prepare ourselves to better handle it by breaking a little sweat earlier in the day. The study, published in the February issue of Medicine and Science in Sports, measured how anxiety levels in college students differed following 30 minutes of moderate intensity cycling (described as “somewhat hard”) and 30 minutes of seated rest. To assess anxiety, students completed the State-Trait Anxiety Inventory (STAI). This tool essentially gathers a snapshot of a person’s emotional state by having them rate subjective feelings of tension, apprehension, nervousness, and worry. On one day, participants answered questions on the STAI before exercise, 15 minutes after exercise, and finally – after viewing a series of images, known to provoke emotion. These include highly arousing unpleasant, pleasant, and neutral pictures. On a separate day, students followed the same procedure with the resting condition. Americans between 18 and 33-years-old – the so-called Millennials – are more stressed than the rest of the population, according to a recent report from the American Psychological Association. However, they are also more likely than other generations to turn to sedentary activities to cope with this stress. Listening to music was most widely reported (59% of young adults), but playing video games, surfing the Internet, and eating were also common ways of managing daily stress. These findings should encourage people to adopt physically active coping mechanisms in lieu of such sedentary ones. It is still unclear exactly how long the anxiety-reducing effects from exercise last, but this study found benefits on mood approximately one hour after the exercise stopped. The duration of these effects, as well as the intensity and length of exercise needed to optimize them, has also yet to be established. It is popular belief that endorphins are to thank for these effects, but Smith cautions that very little evidence supports a role of endorphins here. Instead, he hypothesizes that “the neural networks related to reward and motivation are being modulated and tuned such that there is a resistance to the effects of the accumulation of stress.” The use of neuroimaging will shed more light on whether and how these neural networks, or interconnected groups of brain cells, may be systematically impacted by exercise. I thought that the advent of the new year was a perfect time to revive this wonderful visual lecture. Here, Dr. Mike Evans addresses the importance of exercise and the countless health benefits it brings. Worth the watch! With few exceptions, it’s believed that humans are the only species in the animal kingdom capable of running a marathon. Horses are natural sprinters, sled dogs can be bred and diligently trained for feats such as the Iditarod, and while pronghorn antelope can maintain speeds of 40mph, it is thought they cannot do so much beyond 30 consecutive minutes. Why do we have such a rare capacity for endurance? Is it simply a lucky by-product of our ability to walk on two legs? A landmark 2004 paper in the journal Nature, written by Daniel Lieberman (Harvard) and Dennis Bramble (University of Utah), hypothesized that our bodies evolved as they did largely because of the need to run long distances. In addition to longer legs, shorter toes, broader shoulders, and the ability to shed heat through sweat, adaptations enabling trunk and head stabilization, balance, and powerful spring-like mechanics (such as the Achilles tendon) would have all enhanced endurance running faculties. These traits may have been specifically selected for because running would have benefited hunting, foraging, and scavenging abilities. It’s even been hypothesized that early ancestors brought down large prey by relentlessly chasing them to the point of exhaustion. Greater access to food energies (like protein-rich animal sources) would have meant greater reproductive success. Thus, adept early runners would have passed along their DNA. In this way, endurance shaped our bodies. Importantly, Lieberman and Bramble concluded that our endurance running capabilities likely began during the early evolution of the genus Homo. The first members of this genus, which originated about 2 million years ago, also stood apart from predecessors because brain size was beginning to rapidly increase (see figure at bottom). The onset of endurance capabilities and this increase in cranial capacity have long been considered two separate phenomenon. However, a new theory suggests that physical endurance may not have only shaped the human body, but also driven the growth & development of the human brain. Proposed by anthropologists David Raichlen (University of Arizona) and John Polk (University of Illinois), this theory explains how adaptations intended to improve endurance would have secondary benefits on brain capacities. Aerobic abilities would have become increasingly advantageous as our ancestors – beginning with Homo erectus – shifted to a highly active hunting and gathering lifestyle. Raichlen and Polk’s paper, available in this month’s publication of Proceedings of the Royal Society Biology, pulls from several lines of research. Among them were evolution, or artificial selection, experiments. Mice were systematically bred for either high aerobic capacity (VO2max) or for their inclination to run (lots of time on the wheel). Mice who naturally expressed either trait were interbred for several generations. In both cases, the resulting line of mice exhibited markedly high baseline levels of certain growth factors and neurotrophins. These compounds (i.e., VEGF, IGF-1, & BDNF) boost aerobic abilities by enhancing metabolic regulation and oxygen transport. But, these scientists weren’t just breeding running superstars. These mice showed increased brain growth and even superior performance on cognitive tasks. The same growth factors and neurotrophins that promote cardiovascular endurance also boost the growth and health of neurons in the brain. Foremost among these is brain-derived neurotrophic factor (BDNF) – a critical link in how exercise benefits brain structure and function in humans. If the changes that took place over the course of several generations were applied on an evolutionary scale, it is not difficult to see how adapting a highly active lifestyle could have driven brain growth 2 million years ago. None of this is to suggest that the evolution of an active lifestyle was the only factor that boosted brain size and function. Selection pressures acting specifically on cognitive abilities (rather than athletic ones) may have also played a part. In fact, this has been the prevailing theory until now. For example, improved spatial and relational memory, as well as planning abilities, would have benefited long-distance foraging and the coordination of group hunts. Social skills needed to interact with others would have also required higher-order patterns of thought. Numerous factors likely contributed to human brain evolution, but this theory is the first to suggest that an active lifestyle – in and of itself – was among them. So, what does all of this mean for us? It suggests that if movement helped mold the structure and function of our brains, then our brains likely still require regular physical activity to function optimally. Substantial research now exists to support the idea that regular exercise leads to more robust cognitive abilities in both children and adults. But, could it be that these studies are not actually demonstrating that exercise boosts cognitive abilities, but that the absence of exercise adversely affects them? By adapting sedentary lifestyles, so far removed from that of our hunter-gatherer ancestors, it may be that more than our waistlines suffer. We are bombarded with information that partitions exercise and movement into isolated entities. We learn about heart rate zones, optimal step counts, and the strengths and limitations of maximal oxygen consumption (VO2max). We analyze power output and revolutions per minute, and critique stride length and leg turnover. Yet, what ultimately brings so many of us back to the physical activities of our choosing is simply the fact that they make us feel good. Indeed, the ability of exercise to lift spirits is quite profound and well established in the scientific literature. There is now evidence that both aerobic and anaerobic exercise (namely moderate-intensity weight lifting) have the ability to significantly increase positive feelings, energy, and calmness, while reducing negative emotions and tiredness. Yet, how is it that moving our bodies has any influence at all on our psychological state? Numerous theories have surfaced over the years to account for the beneficial effects of exercise on mood. Some have a psychological basis, while others stem from more biological roots. I’ve highlighted some of the mechanisms below that have received the most support from human and animal studies. These same theories also explain how exercise can reduce symptoms of chronic mood disorders, like depression. Elevated Endorphins: There is significant evidence to show that endorphins are secreted as a result of exercise. The word endorphin comes from endogenous + morphine, which loosely translates to internally produced pain-killers. While these chemicals do not act directly on the brain (cannot pass blood-brain barrier), they do have a calming effect in both humans and animals. In support of this mechanism, several studies have found that when endorphins are blocked, exercise does not have the same ability to relieve stress and anxiety. Decreased endorphin levels may also explain why habitually active people often become irritable and restless when deprived of exercise. ahem. Monoamine Hypothesis: Monoamines refer to a group of neurotransmitters that include norepinephrine (NE) and serotonin (5-HT). Common anti-depressant drugs (Prozac, Zoloft, Paxil, etc.) function by regulating the release of these chemicals in our brains. Substantial research suggests that physical activity modifies the release of NE and 5-HT in much the same way, making these neurotransmitters more readily available in synapses. BDNF Hypothesis: This theory primarily speaks to the long-term effects of exercise and may be especially significant in explaining how exercise can help depression. Brain-derived neurotrophic factor (BDNF) promotes neural growth and generally works to keep neurons healthy. Some have described it as “miracle grow” for the brain, and it is key to many of the topics I blog about. It is relevant here because BDNF also has antidepressant effects. Both antidepressant drugs and exercise increase levels of BDNF in the hippocampus. This region is classically associated with learning and memory, but has also been found to play a role in depression. More on these important relationships later! Other biological theories include the reduction of cortisol (a stress hormone) and better regulation of the hypothalamic-pituitary-adrenal (HPA) axis. These have strong implications for mood, but more directly impact stress and anxiety. Sense of Mastery and Self-efficacy: Because exercise is often viewed as a challenging activity, the ability to commit to it on a regular basis often results in a sense of control, accomplishment, and satisfaction. Merely setting fitness goals can also fuel a sense of purpose. These can all contribute to both immediate and long-term boosts in mood. Distraction: Exercise can serve as a diversion from negative thoughts and other unfavorable stimuli (overflowing inboxes, screaming children…). By forgetting our worries and focusing on our physical movements, we can temporarily alleviate stress and break cycles of unconstructive thinking. Exposure to Nature: Physical exercise often gives people a reason to get outside, and as discussed in my last entry – doing so can positively impact mood states. Social Factors: Interacting with others is important for our overall mental well-being. While some prefer the solitude of exercising alone, exercising with others can foster a reciprocal sense of support. You may help another reach their fitness and performance goals, and someone else may do the same for you. An additional benefit of exercising with people is that you are less inclined to skip a workout if another is depending on you to be there. Unsurprisingly, this increased adherence to exercise equates to more of it! Most likely, the benefits of exercise on mood result from a combination of many of these theories, as well as underlying genetic factors. Regardless of how exactly it is that exercise makes us feel good, I suspect most of us are just glad that it does! There may be hope for Eeyore yet. Comments and questions always welcome! Blake, H. (2012). Physical activity and exercise in the treatment of depression. Frontiers in Psychiatry, 106(3), 1-4. Landers, D., & Arent, S. (2007). Physical activity and mental health. In G. Tenenbaum,& R.C. Eklund (Eds.). Handbook of sport psychology (3rd ed.) (pp. 469- 491). New York: J. Wiley & Sons. Peluso, M., & Guerra de Andrade, L. (2005). Physical activity and mental health: the association between exercise and mood. Clinics, 60(1), 61-70. As the days grow shorter and colder, many of us will resign ourselves to fewer outdoor activities. But, fighting the lethargy of winter months and getting outside may do more than just boost vitamin-D and combat seasonal affective disorder. Moving through a natural environment has been shown to enhance attention and memory, relieve stress and depression, and boost immunity. The therapeutic benefits of being outside may partly stem from alleviating what’s termed directed-attention fatigue, or essentially an overworked prefrontal cortex. In a typical multi-tasking, computer-centric day, your prefrontal cortex is constantly helping you to focus attention, tune out distractions, and shift from one task to another – and back again. A growing body of research supports the idea that spending time in nature provides some cognitive downtime and helps to restore or refresh these cognitive capacities. This notion has led to an entire field of cognitive science known as Attention Restoration Theory (ART). A prominent study on ART was released in 2008 by a team of scientists from the University of Michigan. It revealed that adults performed 20 percent better on tasks of attention and working memory after a 50-minute walk in a park, compared to a walk in a noisy urban setting. In contrast to natural environments, the authors surmise that urban environments are less cognitively restorative because they are filled with mental stimulations, many of which demand our directed attention (e.g., to avoid getting hit by a car). A 2012 study by this same team of scientists showed similar cognitive benefits in patients with clinical depression. Attention and memory benefited more so from the nature walk; however, mood was lifted by walking – regardless of the setting. This is good news for those who may not have easy access to green spaces (more on exercise and depression later!). Preliminary work by Dr. Jason Duvall (also at University of Michigan) suggests that to most benefit from exercising in nature, you really need to be present in it. He suggests that heart-rate monitors, iPods, or GPS devices can all subtly alter the experience of being outdoors. If you are constantly dialed in to a device and addicted to its output, you are not allowing yourself the same cognitive downtime that you would without it. It almost seems that exercising in the great outdoors can elicits a type of meditation. I think this is one place where endurance-type activities have an enormous advantage. You just can’t get “lost in the moment” during a tennis match, cross-fit workout, or game of pick-up basketball. Be it running, walking, hiking, or biking, the repetitive nature of the movements can transport you to a calm, near zen-like “zone” where you are totally caught up in the here and now. For me, this is never more true than when I’m running through wooded trails. It turns out; this is precisely the premise behind “mindfulness training.” Mindfulness training essentially teaches the mind to be attentive to the present and not dwell in the past or project to the future. Because of this link between exercise and mindfulness, a new study in the Frontiers in Human Neuroscience caught my eye this week. Using fMRI, the authors found that 8-weeks of mindfulness training can reduce the amygdala’s response to emotional stimuli. The amygdala is a region deep within our temporal lobes that plays a key role in processing emotions. Abnormalities here have been linked to anxiety, depression, and phobias. So, they essentially found that by regularly engaging in mindfulness, we can provoke enduring, beneficial changes to how our brains process emotions in everyday life. Interestingly, mindfulness training has even been shown to boost immunity by reducing pro-inflammatory gene expression. How’s that for a mind-body connection? The mind aside, Dr. Miyazaki and his colleagues in Japan have unearthed some fascinating physiological changes that stem from being in nature. Walking through natural environments for just 15-20 minutes can lower pulse rate, decrease blood pressure, and lower sympathetic nerve activity (responsible for the fight or flight response). It also seems that it can physically ease stress, as concentrations of cortisol (a stress hormone) were nearly 13 percent lower after the short outdoor walk. This group has even found benefits of forest walking on the expression of certain anti-cancer proteins and the immune system. As winter kicks into full gear, you might reconsider hopping on the treadmill or trainer again and bundling up for a dose of nature instead. You might even try leaving those gadgets behind. I'm a PhD candidate studying the effects of exercise on cognition. With a masters in exercise physiology, I’ve turned my primary focus to where psychology and neuroscience meet kinesiology. Preaching what I practice, you can usually find me running trails or training for my next triathlon. I’m simply a passionate proponent of the mind-body connection, and as a scientist in the field, am excited to share current understanding to a broader audience. Thanks for reading!